It’s jumping around and barking mad – and I’m really enjoying it. I may get around to annotating it further down the line, although it’s a little too embedded in the Batman books for me to get every single reference, but I did want to do my public duty and offer up one thing. 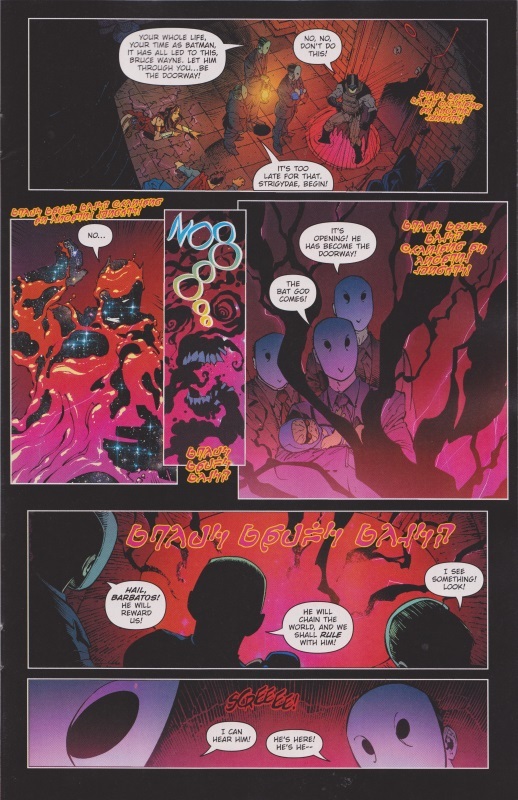 The font that’s used has been in DC’s comics for several years – among other places, it’s turned up in Blue Beetle as the language of the scarab; it was used in Pandora: Trinity of Sin when Pandora (remember her?) cast a spell; and even as far back as Final Crisis: Requiem when it was used as the Martian language. That’s all it says, folks. I’ll admit the question mark after BATS is a guess, but it’s not the same as the exclamation mark at the end of TONGUES. Posted on Tuesday, September 26, 2017 Monday, September 25, 2017 by GaryPosted in UncategorizedTagged Batman, Darkseid, Pandora.